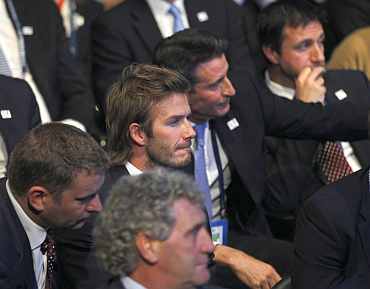 Soccer's governing body's executive committee voted for the two winning bids after a fierce lobbying campaign which saw world political leaders and top sports personalities gather in Zurich to press their case for one of the biggest prizes in global sport. Russia defeated the challenge of three other European bidders, England and the joint bids of Netherlands/Belgium and Spain/Portugal. 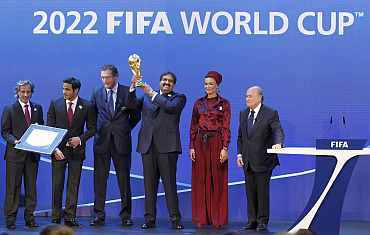 Qatar took the honours for 2022 over rivals Australia, Japan, South Korea and the United States. They committed in their bid document to FIFA building nine new stadiums and renovating three existing grounds at a cost of around $3 billion. Qatar bid chairman Sheikh Mohammed bin Hamad Al-Thani told the FIFA executive: "Thank you for backing us and expanding the game. You will be proud of us and you will be proud of the Middle East." Russia won on the second round of voting in which an absolute majority was required. England, motherland of soccer, was humiliated, going out in the first round with just two votes despite three days of lobbying in Zurich by British prime minister David Cameron. Observers said they may have suffered from an adverse reaction by FIFA to the corruption allegations and to Wednesday's serious outbreak of soccer hooliganism at a cup match in Birmingham. The Russians, leading with nine votes on the first ballot, obtained 13 votes on the second round, ahead of Spain/Portugal on seven and Netherlands/Belgium with just two. Qatar led in the 2022 ballot on each of the four rounds, obtaining 14 votes against eight to the US in the final round. "I think it was the wrong decision," US President Barack Obama told reporters. Australia made a first round exit with just one vote and Japan and South Korea fell out in turn on the next two rounds.